Voodoo Doughnuts is a quirky shop that perfectly captures the oddball nature of Portland, these guys offer up delicious doughnuts and an adventure. Very accommodating of the Vegan crew, they do their best to provide a menu catering to all needs. The original shop was opened in 2003 by Kenneth “Cat Daddy” Pogson and Tres Shannon, friends who made the brave transition to business partners, they remained one of Portland’s best kept secrets for too long until news of their bizarre doughnut combinations and eclectic shop interiors started to spread across the country in a Chinese-whisper ripple of buzz. 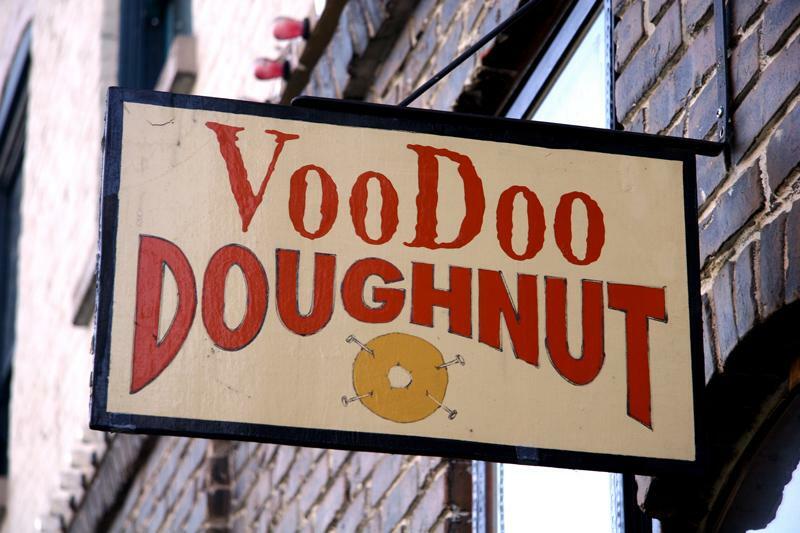 Interestingly enough, Portland itself has embraced Voodoo Doughnuts, in 2008 awarding their ‘Portland Creme’ the title of Portland’s “Official City Doughnut” as a nod to the promotion Voodoo Doughnuts had given the city by naming a doughnut after it, as well as recognising the successful business model that Pogson and Shannon were applying. They’ve managed to stack up a respectable amount of TV time on shows such as Anthony Bourdain’s No Reservations, Doughnut Paradise, Globe Trekker and Man vs. Food, as well as being honoured with a mention on The Simpsons. Their menu offers doughnut lovers a amazing and constantly changing range of doughy goodness, including the Bacon-Maple bar (maple frosting, topped with bacon), Mango Tango (filled with mango jam, topped with vanilla frosting and tang), Memphis Mafia (fried with banana chunks & cinnamon sugar, topped with glazed chocolate frosting, peanut butter, peanuts & chocolate chips), Blueberry Cake (blueberry dough with glazed topping) and a range of Vegan doughnuts that incorporate fruit cakes (pumpkin, banana or applesauce) with assorted toppings. 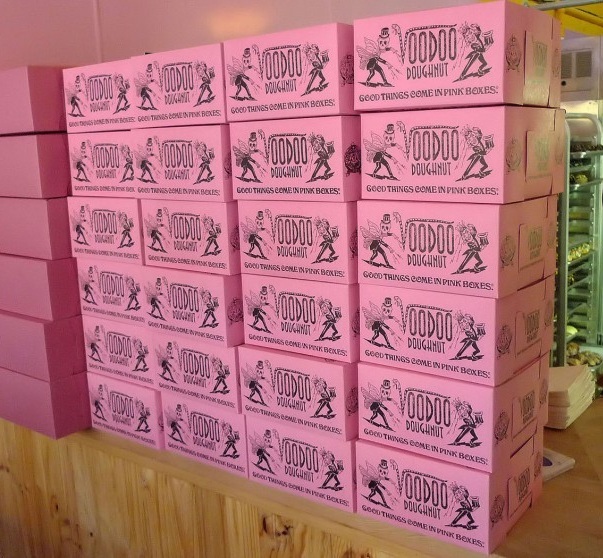 Worth dropping by if you’re ever in the area, just for the thrill of walking away with one of their iconic pink boxes filled with your choice of their Voodoo Deliciousness, and the trembling anticipation in your tummy.